Modpack and SLPs of Eastern European, Middle Eastern and Mesoamerican Trade Workshop graphics, made with cut and paste from the original AoC buildings. To use first unzip, after that open Trade Workshop(you must have Mod pack studio installed). If you have ideas to improve this graphics, please write in the comments below, also if you like them you can use them in your mods. That looks really professional. Kudos to you. Thank you man, this is my first work, i uploaded it just to see how it will be accepted. Recently i discovered a few mistakes in the graphics but i'll update them when they have more improvements :). 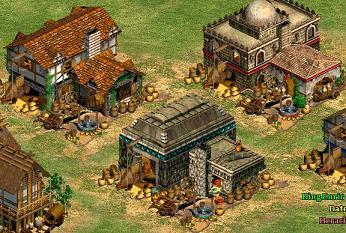 "Trade Workshop Graphics" by todler replaces the trade workshop graphics with civilization-specific custom graphics. The author also provides slps* for the graphics of the different trade workshops. The new graphics may be useful in different settings where their immersion with the original sets might provide a better look to a scenario. The idea of different trade workshop graphics for different civilizations is very creative, unlike the original game where all the civilizations display a single graphic; therefore I give the highest possible marks in this category. The new workshop graphics come in a very high quality. They easily mingle with the original graphics. All the workshop graphics are similar enough to be identified as a trade workshop and yet diverse enough to be identified as belonging to different civilizations. As the previous poster stated, they look quite professional. A slight problem is the little area of dirt in the south corner, which is somewhat unrealistic when used with terrains other than dirt. But I'm sure it can be fixed easily. The instructions provided to use the mod were adequate, although they could have been a bit more detailed for the new users. Since the author has also included the slps for the graphics, it would be nice if he provided some instructions on how to use them. However, as they were only a bonus to the modpack, marks will not be deducted. "Trade Workshop Graphics" is a very high quality modpack that you should definitely use if you want to provide a good setting to your scenario or campaign. As an added bonus, the author also provides the slps for the graphics. *SLPs are files that are inserted in the graphics.drs file to add completely new units. Thank you mate, you are very right for that dirt, i'll remove it and i'll update the modpack. Are you indian? I'm making now a few indian buildings, so when i upload them i'll be glad to have your opinion :). Yes, i'm planning to make italian and russian too, i'm glad you like these :). really good. At last, the trade workshops will be logic for each civ. where carpet do i paste them at?